Trijicon ACOG: Is BAC Practical? It is difficult to describe the “Bindon Aiming Concept” to those who don’t have an ACOG. The Bindon Aiming Concept relies on using the ACOG with both eyes open and letting the bright reticule superimpose itself on the target to allow you to fire. The key with this system is firing as soon as “color” (I.E. the red chevron) flashes on to the target. Delay in firing will force your eye to adopt the 4x image and concentration will shift into the scope. This is not what we want. BAC is sold as a feature of certain ACOG models that can be used as described above. Utilizing the BAC method relies on targeting in short-range engagements… So is it faster than a red dot? Of course not. BAC is a compromise system where you must bend the 2, 3.5, and 4x ACOGs into a role they were not intended to master. I decided to really push BAC up close with my last range session and explore the system a bit further. I started with my TA31F and my 20 inch rifle. So if we are using BAC in any defensive capacity as a civilian then we are having a bad day. Lets get that straight. Should have probably chosen something with a red dot, BUT the Marines in Iraq had to use their ACOGs at close range, so if it must be done, it must be done. What is a faster sighting method for indoors shooting? Is BAC a better system to use or could I aim down the barrel and snap shoot? Is the accuracy of snap shooting a detriment over BAC, or is it the other way around? First off, let’s take a look at what BAC looks like when firing. BAC superimposes the image from the left eye and the right eye to allow you to fire both eyes open and at close range. The above diagram is my best approximation of how BAC looks like in action. Literally, once you see a chevron float on to the target, fire. The ACOG image is off-center because what your left eye sees and your right eye sees don’t line up evenly at this distance. So I hope this gives you an idea of how BAC looks and how it works. Now how does it stack up to simply aiming down the barrel? At close range, I have heard stories of Marines using the finger point method to engage inside buildings. Surely the barrel is another good visual reference for taking a shot at close range and under pressure? At left: A rough approximation of my aiming point using only the barrel with the gun canted 45 degrees off center. At right: Using ACOG and the Bindon Aiming Concept. BAC was surprisingly accurate. What surprised me was how accurate BAC was at this distance. Even though my right eye and left eye fought the image if I wasn’t fast enough (to fire) they both worked out to find roughly the center of mass on this B27. Those were best of 3 attempts at using BAC vs point shooting at close range. As you can see, the BAC was surprisingly accurate keeping all 9 shots (one obscured) in the center of mass. Point shooting drove the shots high and center / right of the target. Point shooting gave me slightly lower splits and a shorter length of time to engage and fire upon the B27. At this close range I would think hundredths of a second DO matter. 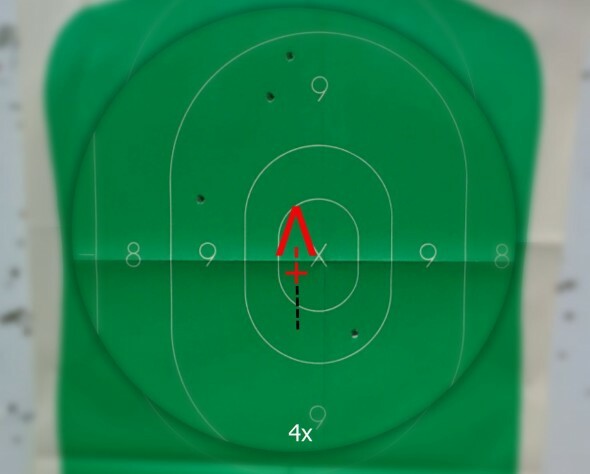 Given enough practice, I believe I could tighten my point shooting technique to make it even faster. I don’t see how utilizing BAC could ever beat quick point shooting at indoor distances. So is BAC really worth the effort to practice with? Useful to understand for a snap shot yes, but other methods of shooting at such close ranges may be more practical. I think I can practice my point shooting and lower those shots more center of mass… and I wouldn’t care about the accuracy penalty at this distance. I will have to master this technique and then try to use it at a competition, but its going to need practice. So is BAC practical? Yes, but it is just not the best choice for an “oh sh!t” moment. Okay, so point shooting is faster than BAC at very close distances. Now what should be compared is point shooting vs a red dot at those distances. If point shooting is still top choice, then use the fastest of red dot/BAC at close distance to compare with point shooting at increasingly further distance. At the distance in which whatever is being compared with point shooting becomes faster at combat effective point shooting, you should then compare BAC and red dot. You’d then have the data for the maximum range that point shooting should be used over a BAC/red dot, as well as whether BAC or red dot is better at the point at which point shooting should not be used. That would help individuals make a decision regarding an ACOG vs a red dot using a distance where it matters (where point shooting is no longer best). C, you’re giving me a headache. AHHH!!!! As for the article, yeah ACOG’s rule! Training is paramount. You must train until you can’t get it wrong.